And then there are all the theme variations: seasonal, fresh, quick and tasty. Like this , to die for! Butter and sugar a cake tin. 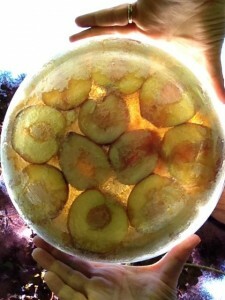 Wash and halve the peaches, throwing away the stone, and lay them in the tin, cut part face down. Sprinkle with a little bit more sugar and butter. Cover it with puff pastry, tightly folding the edges down the side of the tin. Sprinkle with a little sugar. Let it wait for 5 minutes outside the oven, then flip it on a big plate. Be careful: the peaches’s liquid could spill. Do not worry of excessive liquid: it’s yummy!